We are Dan and Scott, the guys from Platter Talk. We are two working dads with six boys who keep us busy in and out of the kitchen. We have mix of old and new recipes, from Scott’s urban childhood and Dan’s rural and simple upbringing. We would love you to stop by and check out some of our food! Today we would like to share some Italian Savory Pies with you. Add olive oil to skillet and over medium heat, saute garlic for 1 minute. Place spinach and garlic in large mixing bowl and add cheese and 1 egg, stir until well mixed. Line pan with phyllo pastry. Place edge of 3 or 4 layer thick phyllo on center of pan and cover toward edge allowing excess phyllo to hang over edge of pan. Repeat for the other half of pan. 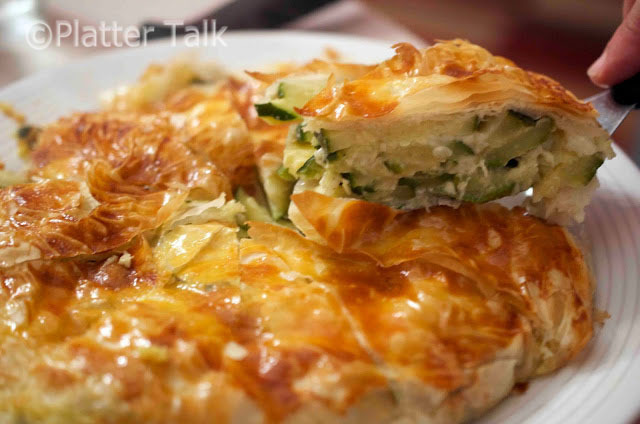 Brush inside of phyllo dough with butter. Scoop spinach and cheese mixture onto phyllo lined pan and fold overhanging edges of phyllo dough toward center to form a top crust. Beat remaining egg and brush outside of dough with egg wash.
Bake for 25 to 35 minutes or until crush is golden brown. Add olive oil to skillet and over medium heat, saute garlic and zucchini for 5-10 minutes until tender. Place zucchini and garlic in large mixing bowl and add cheese and egg, stir until well mixed. Scoop zucchini mixture onto phyllo lined pan and fold overhanging edges of phyllo dough toward center to form a top crust. Add sausage to skillet and brown over medium heat. Add broccoli to sausage, and over low heat, use a fork to coarsely mash the broccoli and sausage together until fully incorporated. Place broccoli and sausage mixture in large mixing bowl and add cheese and egg, stir until well mixed. 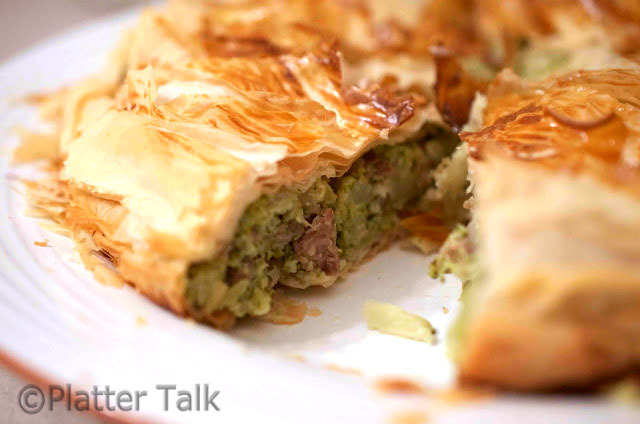 Scoop broccoli and sausage mixture onto phyllo lined pan and fold overhanging edges of phyllo dough toward center to form a top crust. Thank you for hosting! We had a blast!